Did you know the peak season for asparagus is April to June? Look for bright green stalks that are firm with tight tips. I enjoy this delicious and healthy spring vegetable in any form. 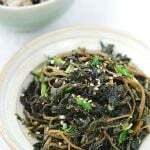 Here, I used them in a traditional Korean dish called sanjeok. 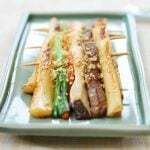 It is a variety of jeok – skewered meat and vegetables. Some jeok varieties are egg-battered, but sanjeok is not. 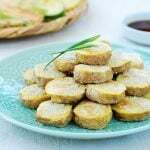 Depending on the ingredients used, they are called gogi (beef) sanjeok, tteok (rice cake) sanjeok, songi (mushrooms) sanjeok, pa (scallions) sanjeok, etc. 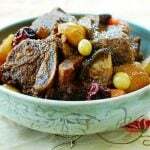 They are traditionally served on holidays and special occasions. 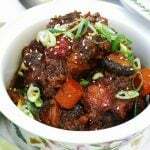 Growing up in Korea, my parents always made gogi (beef or pork only) sanjeok for those special days. It was always my father’s job to thread the meat onto the skewers – he took the job very seriously to make sure all the pieces were the same length and lined up evenly on the skewer. Today, this dish is enjoyed casually any time of the year. As with any skewered/kebab dish, you can have fun with it by mixing up different meats and vegetables. Remove the tough ends of the asparagus. Cut into about 4-inch lengths. Blanch them in salted boiling water just to soften, about a minute. (This will keep them from breaking when threading.) Shock in cold water and drain. Cut the mushrooms lengthwise into 1/4-inch thick and 5-inch long strips. Rub each vegetable with the sesame oil and sprinkle salt and pepper. Thread the meat and vegetables onto the skewers. Heat a large pan with a little bit of oil (1 teaspoon) over medium high heat. Place the skewers in the pan. Cook each side until the meat and vegetables are cooked through and slightly caramelized, 2 – 3 minutes each side. Thank you, Rebecca! I’m sure he will. This kind of skewered meat dish is very new to me! 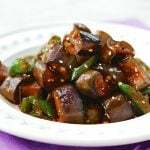 This is a fantastic idea for serving beef and asparagus other than the “regular” stir-frying method. Thanks for introducing the sanjeok, Hyosun! You’re welcome, Arudhi! Hope you get to try it one day. That looks so beautifully presented! i love your blog! I’m trying to start my own too! thanks for being an inspiration. Thank you, Mabel! Good luck with your new blog! I’ll visit soon. Thank you, Nami! All you need is a bowl of rice with this. How beautiful! And I bet they are also delicious! Thanks, Jeannie! Pork will be great. Enjoy! Yum! 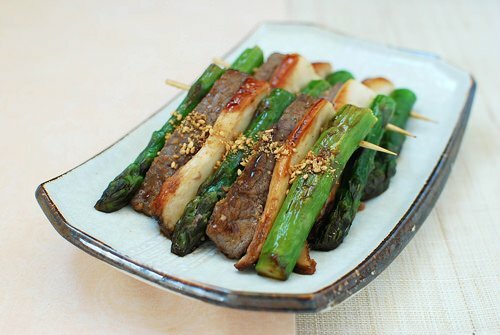 Reading about this skewered beef/asparagus/mushroom is making me hungry! Love the combination of flavours! I think I’ll try this out on the bbq sometime this summer! Hi Amber – Try it. You’ll like it. Thanks for coming by! Hyosun, I have never seen such an extraordinary way of skewering foodi (It’s funny because I wrote about skewers today too). It gives me lots of ideas! I have also already started to cook with asparagus this year, but I would never think of pairing it with eringi (or King oyster mushroom). This is one of my favourite mushrooms and I am lucky to have it available here almost all year round (even though it’s quite expensive). I will certainly steal your idea one day! Thank you for contstant inspiration. Sissi – I am glad you like it. I will come over to see what you wrote about skewers. I love king mushrooms and use them all the time. Definitely good for you! What a great combination..you took such a beautiful pics, just stunning! You really did fantastic job! Thank you for sharing, can’t wait until I try it! Love your recipes! I am totally making this one! I know I said this before but it is so worth repeating. I LOVE your food. Gosh this looks so good and well balanced too. I so love your food. This is not just attractive looking but I can imagine the wonderful taste and the fact that this is a healthy meal takes it over the top. This looks beautiful and delicious as are all your food. 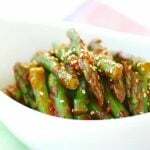 I love asparagus and this is looks like a very tasty way to prepare it. Thanks so much for checking out my post. It’s always nice when friends drop by to say hello. I appreciate your friendship and support these last 2 years more than I can say. Sorry I haven’t visited as often as I’d like to, as I truly have been up to my neck with book writing projects. In spite of my absence, you remain one of my favourite bloggers. 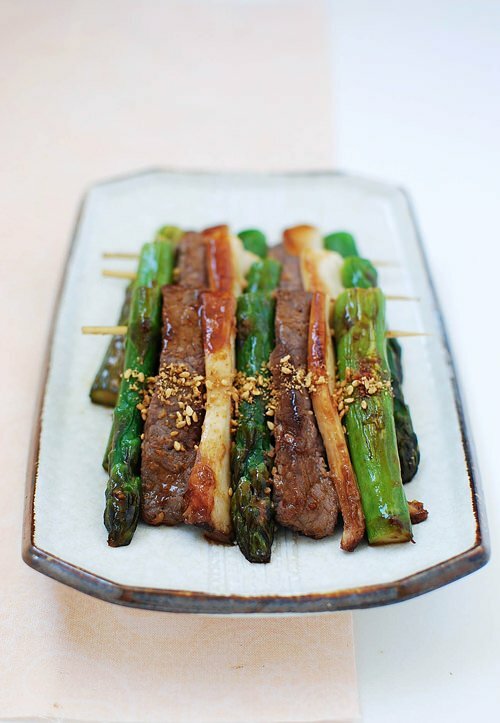 Btw – your beef and asparagus skewers are actually making my stomach growl. Piles of beautiful asparagus are starting to invade the supermarkets and this is a lovely way to enjoy them. Thanks for the idea! 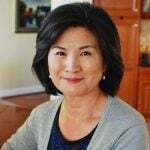 Hi Susan – Thank you so much for all your nice words and support! You’re the best!! You’re so welcome. It’s my pleasure. It’s always so good to see you!